loses his girlfriend and then begins a long winding road back to his once beautiful marriage. Sounds twisted? Yes, it is, but what is captivating about this story is you really really like the characters and want them to be happy. There is not so much anger as you just want to bop Richard in the head and wake him out of his ridiculous stupor. Richard and Anne have been together almost a decade. She is a successful, beautiful, sophisticated French lawyer and Richard is a British artist that is having a mid life a bit young (only 34!) and is at a loss with his relationships and his artwork. All at once everything seems to be unravelling. Poor little Cam, their 5 year old daughter is caught in the messy tangle. With heartfelt wit and insightful retrospect Richard goes back to his childhood home and retraces his life. He is grateful for the lessons that begin to transform his priorities and get his life back into shape. But now he must convince Anne to give them a second chance. Forgiveness is hard, forgetting seems near impossible but can love really conquer all? Set in Paris which never fails to bring delicious food, lots of wine and an enormous amount of free time, Richard and Anne have only two choices, begin again or end their marriage. Thoroughly enjoyed this glimpse into the lives of this crazy cast. 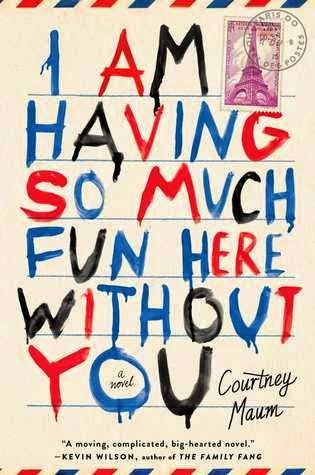 Loved the writing by Courtney Maum, a mix of humor and intellect. Even under the most bizarre circumstances, the reality is not all that different for every couple.